Prefer to listen to and watch me discuss this on video? Click this image! If you aren’t eating clean (or even healthy) at ALL, one way that you can get on the clean eating path is to start out by making a decision to convert one highly-processed item per meal, and put that into practice until the ENTIRE meal is clean! Let’s say that every weekend you eat (boxed mix) pancakes topped with syrup and margarine, and bacon on the side. You could begin cleaning that up a bit by switching over to real butter instead of margarine. Then next time, make your pancakes from scratch using base ingredients such as: flour, buttermilk, eggs, salt, and baking powder. And then the next time, use real maple syrup as opposed to the sugary, processed, commercial brands. 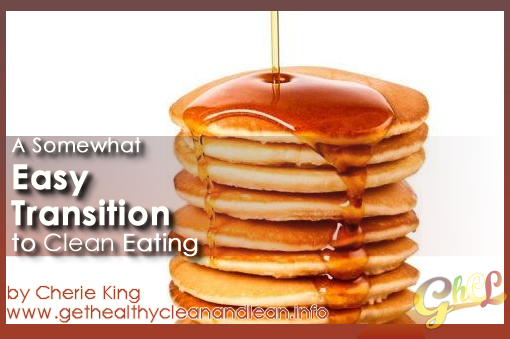 And naturally the pancake recipe can be cleaned up a bit more by changing the table salt to real sea salt; swapping out white flour for unbleached, then whole wheat, then perhaps some kind of grain-free variety such as almond flour or coconut flour – IF you want to go that far with it. But work your way UP to that point! The whole idea of clean eating is to try and eat foods as close to their natural state as possible, or at the very least, as minimally-processed as possible. Once you’ve done this with one meal, you can then move on to other meals that you prepare and begin cleaning those up as well!